Syllabus of the Online Course (Subject): South Korea-Africa Economic Cooperation Conference (KOAFEC). Description of the Online Course: South Korea-Africa Economic Cooperation Conference (KOAFEC). The Africa-South Korea Partnership (South Korea-Africa Economic Cooperation Conference) is a mechanism and framework to improve relationships and economic cooperation and maximising synergies between African Countries and South Korea. The long-term partnership between South Korea and Africa was launched in 2006, with the support of the African Development Bank and the Export-Import Bank of Korea (EXIMBANK). 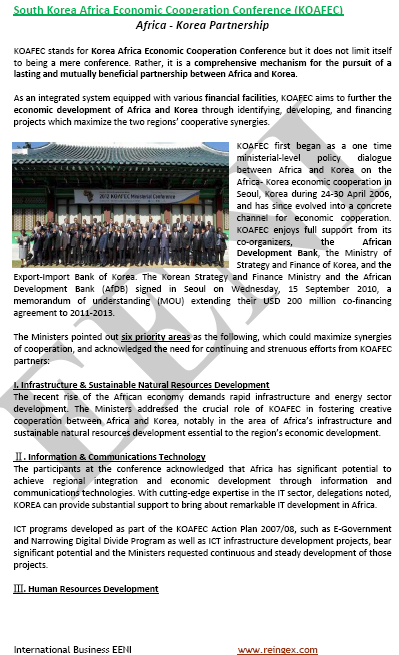 The Action Plan of the Korea-Africa Economic Cooperation Conference (KOAFEC) is managed by a Consultative Group formed by Directors of the African Development Bank, Government of South Korea and the Export-Import Bank of Korea.